Cyclists are being encouraged by the NZ Transport Agency and Auckland Transport (AT) to make use of the latest addition to the city’s cycling/walking network in Grafton Gully alongside the CBD. The 300 metre-long cycleway – between Grafton Road and Alten Road – opens next Tuesday (16 July). It is the first stage of the 1.9 kilometre-long project to extend the popular Northwestern cycleway into the city centre and university campuses. The Transport Agency’s State Highways Manager for Auckland and Northland, Tommy Parker, says the extension is giving people more transport choices. The completed Grafton Gully Cycleway will cost $11m, and is jointly funded by the NZTA, Auckland Council and Auckland Transport. Mr Parker says walkers are not being overlooked. The new cycleway is 4m wide and provides comfortable space for walkers and cyclists to share the new link. Auckland Transport’s Chief Operating Officer Greg Edmonds says it is great to see Aucklanders getting more transport options. “We hope this cycleway will be a popular choice for cyclists and walkers heading into the city.” says Mr Edmonds. The next stage of works will be the extension of the Grafton Gully link from Beach Road in Parnell to the city’s waterfront to connect with the shared cycleway/walkway along Tamaki Drive. Next Tuesday, people will be able to take advantage of free bike health checks when the extension opens at 7.30am. Of course the main section, down through the gully itself still needs to be built but it is good to see some progress on the overall project. I also suspect that this section will really come into its own once the Parnell Train Station opens – which is most likely to happen sometime next year – as it would provide an excellent route for students (and staff) accessing the University. As shown on the map above, while the NZTA is building the cycleway alongside the State Highway network, Auckland transport is going to be building one alongside Beach Rd. Auckland Transport have now released some more details about this section. Here is what they say. Auckland Transport is seeking feedback on the proposed construction of a cycle route along Beach Road, from The Strand to Britomart Place. 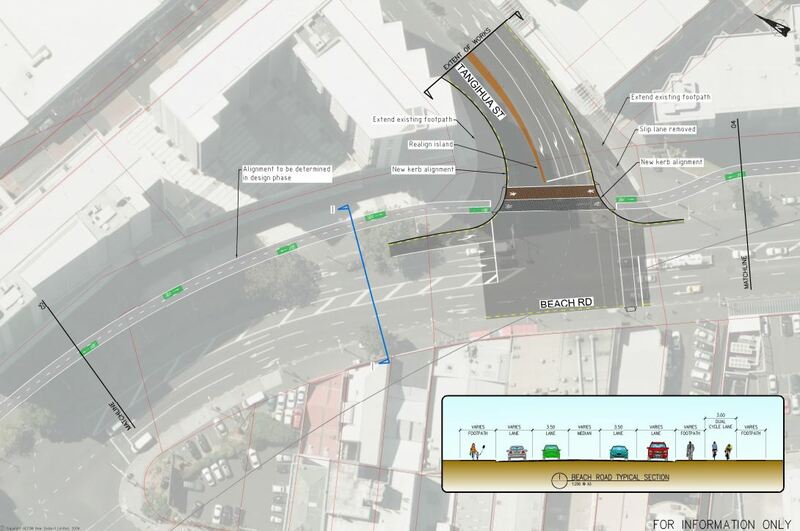 The proposal will provide a three-metre wide two way cycle path between Churchill Road and Britomart Place with a link through to Quay Street via Mahuhu Crescent and Tapora Street. The cycle route is expected to be predominantly off-road and includes the upgrade of various intersections to provide a safer environment for pedestrians and cyclists. Due to limited roadway width and the need to improve safety for cyclists, there are many areas where the removal of on-road parking is proposed. The proposed improvements which provide better access for cyclists into the CBD and waterfront are part of a larger Auckland Transport initiative to upgrade the city’s cycle network. When completed, the cycle facility will link up with the existing cycle facilities on Quay Street to the proposed Grafton Gully cycle path which is currently under construction. It is also part of a wider Harbour Edge Development Programme to better connect the many parts of the waterfront and re-connect the city with its harbour. At the Southern part of Te Taou Cres the cycle path crosses to the opposite side of the road across a new crossing (currently it is only possible to cross on one side of the intersection). From this point on it appears that the cycle path will be separated from the road traffic by a raised median which is excellent. 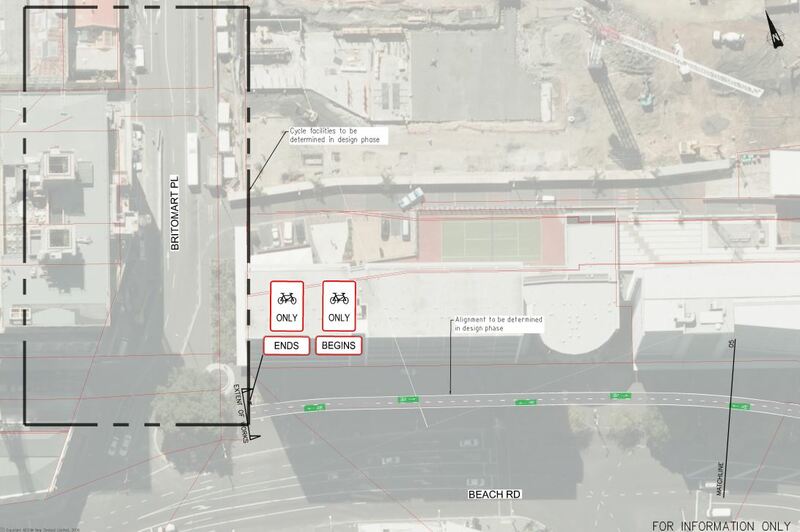 There are also raised pedestrian crossings at both entrances to Te Taou Cres and at Ronayne St.
At Mahuhu Cres the slip lane is removed to allow part of the cycleway to branch off towards Quay St. Again there is a raised platform for both pedestrians and cyclists to cross the road. 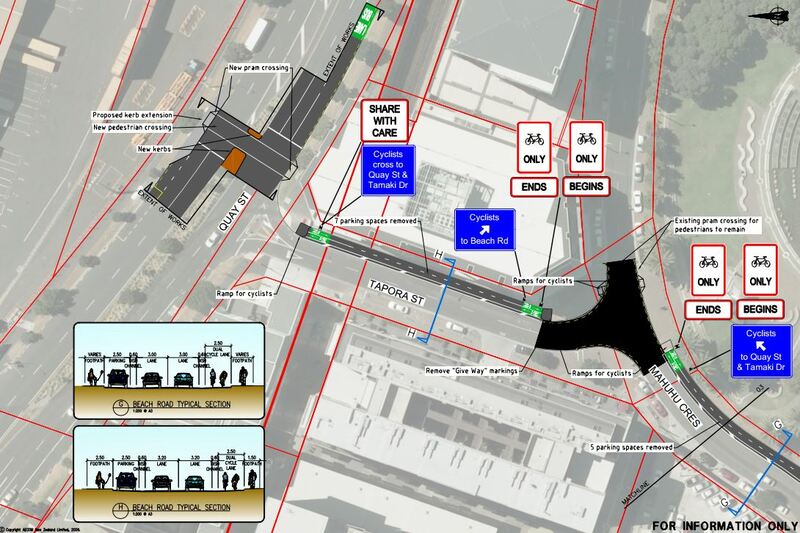 On the branch out to Quay St we see the cycleway continued and a new pedestrian/cycle crossing on Quay St.
All up this seems like it is going to be a superb project, not just for cyclists but for pedestrians and our general urban environment so well done to Auckland Transport. Features like raised pedestrian crossings across minor streets, additional signalised crossings of main roads and separated physically separated cycle lanes are excellent and long overdue. I just hope that the plans don’t get scaled back before this is built and we can see these features rolled out to more locations soon. Improving cycle access to Britomart can only be a good thing and should encourage more uptake of bike+train mobility. While not a regular cyclist, I am a frequent pedestrian along Beach Road, walking from work in Parnell back to Britomart. So I can’t speak to the benefits for cyclists (looks really good however! ), but the improvements to the streetscape for pedestrians look excellent, especially the removal of the nasty left turn slip lanes into Beach Rd. I hope, with reference to the last image, the opportunity is taken to rework Britomart Place. The current traffic calming and ped crossing is ineffective, and speeds are too high (still a 50 zone). Really should be a shared space for pedestrians, while providing access for cyclists to Quay St.
Yeah, as another daily walker on this route I think this package of ped improvements is a top outcome from this project, even if only a ‘secondary’ part of the planning. Seems like lots of improvements in AKL need to be pursued under the cover of another agenda to get them delivered. Just another wish item to add to Raffe’s (which I totally second). I really hope that none of the left turns have any of the ridiculous phasing where vehicles get a green light to turn at the same time as peds and cycles have the green crossing light on side road entrances. Would kinda undermine the whole point of the physical interventions, surely? Does anyone have/know that detail yet? Hi TimR – I would not expect that such detail already exist. 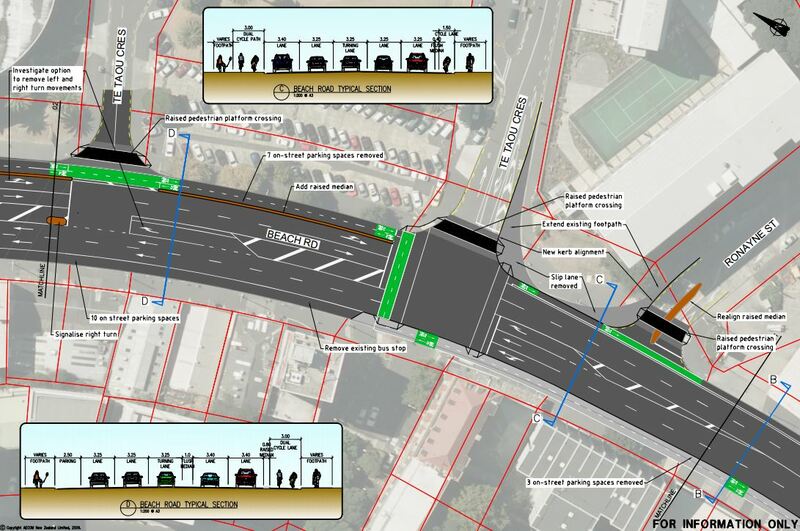 The plans are still relatively rough, and such a scheme (two-way cycleway) is new here in NZ. On the other hand, since it is so new, and since it is two-way, I would expect that fully separated phasing will be part of it for safety reasons. Re riding out west – shame. It will probably take until Waterview is done before something gets done to get the Avondale-Waterview section up to a spec were people feel happy to ride this. When I was buying a house, that was actually our outer limit. Not so much because of distance, but because I just couldn’t see myself riding GNR there every morning. Fair enough on the detail! Waterview totally makes sense from the bike point of view, thought along those lines myself at the time, and know a few people who chose it in part for that reason. I was looking for more of an established, walkable town centre, GE hit the mark and was much cheaper than the Isthmus. 30 minutes on the (electric) train felt do-able. Ooh, awesome. Any idea when they’re doing the Beach Rd stuff? And yeah I agree with Raffe that those pedestrian crossings are none too soon, the western intersection with Te Taou Crescent is particularly bad – lots of pedestrians, and poor visibility for cars thanks to the parking spaces hard up against the intersection. Not a safe combo. Even the Ronayne St intersection can be a bit dodgy as cars can swing in there quite fast from Beach Rd, and “rat run” over to The Strand. This’ll be great. 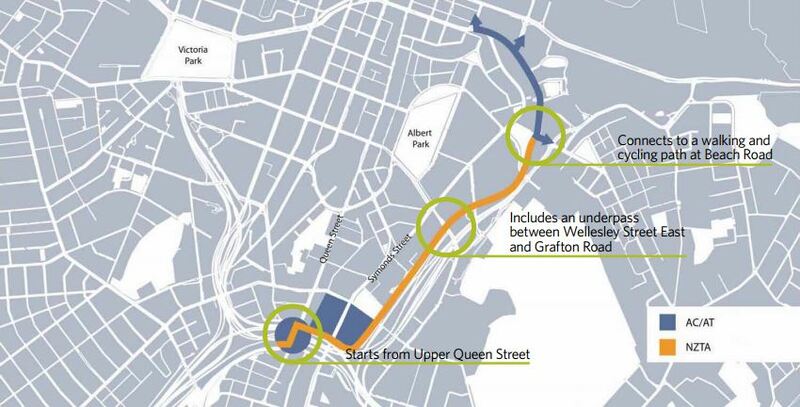 Of course then it’s up to Quay St, along the waterfront and over the Skypath. Yep, we always pushed it that way – CAA’s tagline for this project was “Everything meets at the waterfront”. Hopfully this will be start of something great as people realise how proper cyclelanes are a big step up from just more on street car parking. When does the consulation start ? Projects like this need lots of popular support to help create momentium. Consultation should start soon – they have been providing draft letters to the Local Board. I agree with the need for public support – we (Cycle Action Auckland) have been asking for the consultation to be public (i.e. not limited to residents and property owners) as this really affects a lot more people, and those who benefit from such changes – pedestrians and cyclists – should also have a voice. The crossings at Britomart Pl and Tangihua St are lethal given the number of pedestrians that uses them daily. 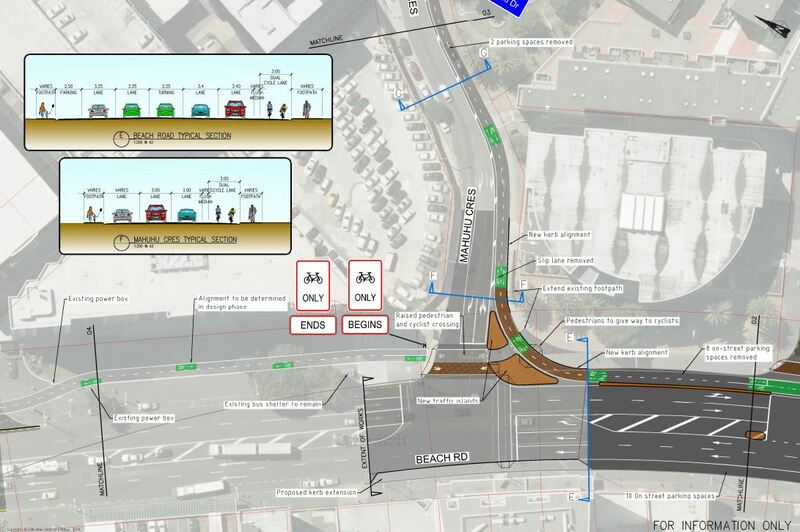 It looks like they’re improving at least the Tangihua St crossing by removing that awful free left turn from Beach Rd. I too think that Britomart Pl should become a shared space. Every slip lane in the city should be programmed removal. Lethal, vlie, wrong. And each new resultant public space ought to then get a street tree. Grand. Getting rid of those lip lanes is the single best bit of this project IMHO. At peak times it is near impossible to cross there without stepping in front of a fast moving car and hoping they see you and slow down enough. Actually, I think the cycleway is the single best part of this cycleway project 😉 But agree that the slip lane removal is an unexpected benefit! I think slip lanes are okay if they have raised table pedestrian crossings – but near the ports, those are unlikely to happen! Max I love raised ped tables, but we really need our laws to change to offer more protection for pedestrians and cyclists for these to be really successful and for the priority that these tables suggest is given to foot path users to be actually the case in the law. Does CAA or any other body you know of do any advocacy on this kind of issue in NZ? Based on some research and literature research I have recently done for work purposes (not CAA), it appears that slip lanes (even without zebra crossings and raised tables) are actually quite safe. Ironically, about as safe or possibly even slightly safer than intersections with a left-and-through signalised lane and a “give way to peds when turning” sign! I won’t argue about the fact that they often don’t FEEL safe, and certainly can make crossing hard (i.e. they are reasonably safe – but not very efficient from a pedestrian perspective, which is the 2nd side of the coin for a good walking environment). Regarding side road priority – I am aware that Living Streets Aotearoa has a campaign regarding give way rules across side streets. Perhaps the slip lanes ‘appear’ safe through stats, as many pedestrians just try not to use them or because they seem so dangerous and take extra care (perceived risk high = low real risk). When I’ve spent time observing (in the case of non zebra slip lanes) as a pedestrian is that they give absolute priority to drivers and I’ve also seen this attitude on zebra marked slip lanes as well. Drivers are normally looking right to observe turning traffic and do not take much notice of pedestrians. I’m a pretty observant driver, but even I have found myself doing this, thus I feel the slip lane design is at fault. Bryce exactly right. They are inherently dangerous as the driver is looking right for vehicles to give way to and therefore is likely to not see pedestrians approaching from the left. Also even with a crossing the design of the slipway implies it is there to allow the driver unimpeded travel through the intersection… what else is it for? The god of traffic flow is its master. Add a ped crossing and a poor hopeful pedestrian may actually believe that an Auckland driver might consider for once that they don’t always have absolute privilege and give way to them. Tragedy ensues. Which brings us to raised ped tables, which I love and want more of, on the side streets off Ponsonby Rd for example. These do of course imply that the footpath user has some kind of increased priority, yippee, but my understanding is that legally these tables are still part of the ‘carriageway’ so there motorists [and cyclists on the road] have RoW. This has led some I’ve discussed these with to argue that they are confusing and dangerous because they send mixed messages to road and path users. Clearly the answer is a law change in line with European countries where the motorist has a duty of care for both the more vulnerable pedestrians and cyclists and the cyclist has the same for pedestrians, no matter where on our roads and streets they are. A sort of law of responsibility inverse to vulnerability. A change in the law, giving pedestrians and bikes the row when crossing a ‘t’ intersection, combined with a solid painted strip across the street and some kind of street narrowing at the entrance (kerb extensions?) would make a huge difference and be very cheap to implement. Anyone know how much a raised table costs? Max? Patrick – I strongly support a change of the side road priority law, and I agree that slip lanes are unpleasant for pedestrians, doubly and triply so when there’s no raised table. Though “inherently dangerous” is NOT correct. That was my own perception, but statistical study of several thousand crossings (including several hundreds with slip lanes) in Australia has shown that the facts don’t support that. If you want, I can provide you with a link to the study. Again, not saying they are good (we all know significant other reasons they should be avoided in residential and town environments) but facts-based review just doesn’t seem to agree with the safety concern being significantly above “default” treatment, and in fact indicates that they may be slightly safer (probably, as mentioned, because people perceive them as dangerous). Re confusion at ped tables – again, there’s the argument that confusion is good if BOTH sides are a bit confused about priority. Just like shared spaces, where clear rules are abandoned for negotiation and care. If you want to see how “confusion” can actually work quite well, have a look at the raised ped crossing (no zebra) at the western entry to the Auckland Domain. I walked across this daily twice for many years, and it works like a charm for both peds and drivers. That said, I DO favour adding zebra crossings on raised tables. Might as well swing the pendulum a bit more emphatically towards peds here in Auckland. Re costs of ped tables – sorry Bryce, couldn’t really say. I would think if built-in from the start, as a concrete table, they shouldn’t cost more than a high 4-figure or low 5-figure number. Stormwater drainage can be a hassle and costly though, as they can disrupt existing flows, and one has to build new drainage and/or channels along the side. Went for a spin yesterday to have a look.. no barbed wire or guards in sight so had a go down the new bike path.. top quality, nice and wide. 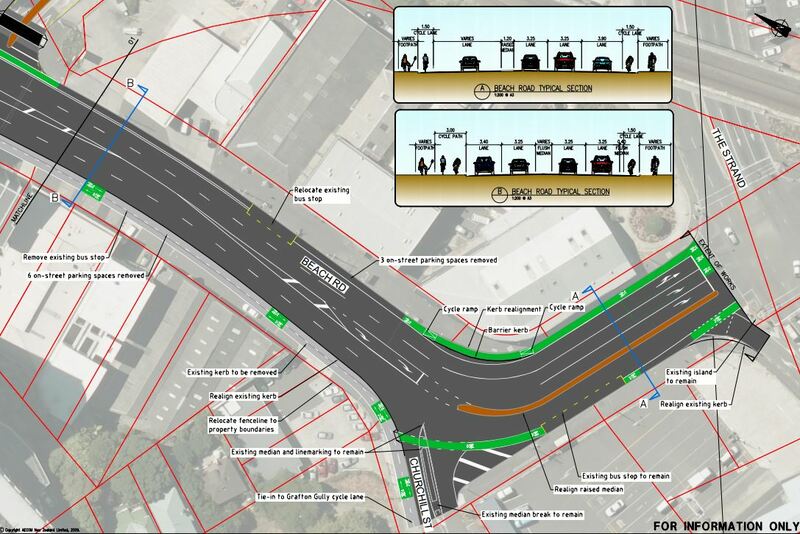 Looking forward to the Beach Road cycle lanes.. the plans look great, really well thought through. Looks good, would be even better if the budget extended to painting the whole thing green rather than just sporadic swatches. Hi Newnewt – more green paint is not really needed when its pretty much all off-road, or separated from traffic by a kerb! Maybe they should just pave it in red chipseal or light concrete or something, give it that differentiation from day one. Never been a fan of the green colour myself. I agree Nick. The green looks good in small patches but in a big patch it is a bit gaudy. I think the red chip seal / asphalt / paint is a better mix. What we do need is a nationwide colour as per the Netherlands. Why not make it a different colour to the bus lanes? We do have a nationwide colour for cycleways – it’s green. Unfortunately, by the time they’d agreed on this (back in 2001), Christchurch had already decked out its city in red cycleways, so they’re a bit of red/green mix at present until all the old bits have gone. Pretty much everywhere else in NZ is green now though. Oh ok. I just prefer the red :-). The green just seems to blend into the road unless it’s bright green like a busway. Once we get cycle paths next to footpaths (not on the road) in suburban situations, how do we differentiate between footpaths and cycle paths? Green asphalt? The old red footpaths in Remuera were nice. A much nicer colour than green in my opinion. Why did we select green by the way? Once we build dedicated cycleway paths, we should place them on a separate kerb from the footpaths! That will work better than colour. It is good to see these projects come to light. Well done NZTA, AT and CAA (and Local Boards). As a detail, it would be good to tidy up the blue signs in the Tapora St section. Why not replace the word “cyclists” with the bike symbol (as on the white signs), and why the “to” in “to Beach Rd”, etc? The arrow says it all on “proper” road signs! And I’m a bit mystified by the “Cyclists cross to Quay St and Tamaki Drive” sign, given that you’d already be on Quay St, and the crossing of Quay St doesn’t seem to have any provision for cycles. It says “new pedestrian crossing” and “new pram crossing, with no cycle lane or shared path leading to it.. Despite having some relatively fine detail in it, these plans are comparatively early. There’s tons more design to be done, pending overall agreement on route & facilities. We (CAA) will definitely clarify that all signalised crossings the cycleway uses are to get cycle aspects (“aspects” are the little light-up parts of the traffic signals) to make it formally legal (as well as the practical reality) that cyclists ride across these, rather than have to (in theory) get off their bike and wheel it across. In response to the query about who is advocating for a law change to improve pedestrain safety. One of the transport advocacy areas of the Waitemata Local Board (which forms part of the Council’s 13/14 Annual Plan) is for Auckland Transport to push for a change of the give way rule requiring motorists to give way to pedestrians at intersections. Good work Pippa. A general change to make it clear that those capable of causing the most damage must take the most care is what is needed. Need to add Ponsonby Rd to your list; raised tables and limits on side streets. Some right hand turns in and out of side streets too. The top of MacKelivie should become a shared space and right turns in and out should go. I think with the road rule change, stop signs, and prominent crosswalks we wont need as many raised tables. I think you’re right Kent. Change the law. Narrow road entrances, paint some crossings (to give a physical presence) and then over time and as budgets or safety audits allow, build footpath / cycle path level road crossings as per other places. Excellent work Pippa. I will be forwarding that to my Local Board. I would encourage others to do the same. Good idea.. I’ll forward to the Orakei LB. It will do them no harm at all to see the rest of excellent WLB wish list as well as the rule change advocacy. There are a lot foot traffic that cuts across there. Many students living in Ronanye St apartments and town houses who use that route as well. regarding the slip lanes I agree with Max. They are safer because pedestrians are less likely to step out into traffic. Taking out the sliplanes will potentially increase pedestrian injuries. I believe the law change on pedestrian priority is not going to be easy because it may actually make things less safe for pedestrians. Also regarding the slip lane removal, taking them out can significantly increase pedestrian delays. This is because of the way the traffic signals work. We would be increasing ‘perceived’ safety in exchange for guaranteed increased pedestrian delay. It is perceived safety because we don’t really know if removing the slip lanes actually increases pedestrian safety. Having said that, we shouldnt have slip lanes in a high pedestrian area because they are near impossible for impaired pedestrians to cross. I like raised table zebra crossings but they are a serious issue for buses. Yes slip lanes are safer if they make it functionally impossible for a pedestrian to try and cross the street. With regard to Tangihua St, I would happily accept the ‘delay’ of waiting for a pedestrian phase over the ‘no delay’ of standing there for ten minutes as car after car speeds through the unrestricted left turn without any gap to cross. I would welcome the ability to cross once every two or three minutes over basically never being able to get across at peak times. I wouldn’t be surprised if that is a very safe intersection for pedestrians, the same way that spaghetti junction is a very safe intersection for pedestrians (not a single recorded incident!). Paraphrasing- slip lanes are safer since they are more dangerous. Kent, not necessarily, I would argue that you could say “slip lanes are safer since they apprear more dangerous”. Nick, re your comment on Tangihua – fully agree in these situations. Which is why in places were pedestrian demand meets high vehicle demand, slip lanes are not the right thing. Either place a raised table & zebra on them (not very feasible here, due to the port trucks) or pull them into the signals. Why are we inviting trucks to use Beach Road to get to Tangihua to get to the port in the first place? Push them onto Quay St. I cannot see any way that non-controlled slip lanes are not dangerous for the young, old and mobility impaired. I’m guessing they avoid them completely. If you’re going to control the slip lane with signals, and you need to allow for frequent truck use, then you may as well get rid of the slip lane and create a, truck friendly, standard intersection. Ari, can you point to one City where people just love slip lanes since they improve pedestrian mobility? Kent, I can’t point out a single city, but that doesnt mean it doesnt exist. Also I think you must have missed my point entirely. People tend to mostly complain about stuff as opposed to talking about things they love. So I don’t think anyone has really done much study into what people like or don’t like. But to a road engineer that is less important than the safety of the road user. People probably don’t like traffic lights at all, but what they want is not as important as public safety. There is evidence that slip lanes aren’t as dangerous as we may have originally thought so to remove them for safety reasons is illogical. From the stats, slip lanes without zerbas appear to be safer than slip lanes with zebras and as safe as a crossing from the corner. There could be myriad reasons behind this, but the suggested idea is that pedestrians are stupid and walk out in front of cars without looking when they assume they have ROW on the zebra crossing (which they do). Yes there are plenty of drivers that are stupid and don’t look and break the law and don’t give way, but they won’t be the party that comes worst off in a collision. If you are going to have a slip lane, have no zebra or a zebra on a raised crossing, but you have that with a bus route so you have to remove the slip lane. As I said, in a high pedestrian environment, the slip lane is not appropriate. But then you just get all the complaints about left turning drivers crossing in front of pedestrians all the time and running red lights. I don’t think we need to remove slip lanes for safety reasons. We need to remove them since they are entirely anti-urban and defeat the whole purpose of a city. But an environment full of slip lanes will greatly discourage pedestrians. Ari your argument is backwards- first you want to make an anti-pedestrian environment then challenge pedestrians to survive it before you will consider fixing it. Because they are, of course, concerned about safety, but not where it compromises traffic flow; the god of all things. Some, are, thank you very much! Such as myself, and others, like Colin Brodie, NZTA’s Chief Advisor, Safety? Please lets not make this a black&white conversation. We know there are lots of good ones out there like you Max, and at NZTA, and of course you’re right about generalisations, but we do get plenty of the old school to deal with too. Sometimes in the comments here. Present company excepted, there is a school of traffic engineering that argues that all intersections should be designed on the basis of un-nuanced statistical analysis which is rather like the National party argument that goes along the lines of ‘if 85% of people commute using cars, then that’s where we’re going to put the funding’. I suspect you have to look at the issue holistically. I recall, years ago, working with Bill Hillier at the Bartlett School in London on a sink council estate redevelopment. During the process of trying to redesign the place Hillier determined that one of the contributing factors for the estate falling into decrepitude was not that it was mugging central but rather that it was perceived as mugging central. It’s the same for intersections: pedestrians are deterred from using them not because they’re necessarily unsafe based on a raw statistics but that they’re perceived as unsafe, so pedestrians are deterred from using them. Over a period of years, particularly as intersections are redesigned to accommodate greater traffic volumes, pedestrian use cumulatively diminishes so that, from a statistical perception, they’re non-existent. The flawed design of the intersection is therefore deemed successful although, from a community perspective, it’s become an unpassable traffic sewer. I read an article recently that the ’85th percentile’ method of setting speeds was developed for freeways and the open road. That it came to be used as justification for speed limits on residential roads is a travesty. They should have a wider look at the area around Te Taou Reserve. This would be an ideal opportunity to remove much of the ugly parking there and extend the reserve. One of the Te Taou Cresent connections to Beach road could possibly be closed. Also that strange parking area below the parliament Street steps could be improved or removed. I’m not. It involves moving kerb lines, which means redoing drainage, probably moving services, it means reconfiguring intersections, traffic lights, resurfacing, repainting etc. Reconstructing part of a busy downtown street is surely more expensive than building a house. Nick, I don’t believe the costs for Beach Road have been released yet? The 11 million and 1.9km is for Grafton Gully only. Oh right, sorry I misunderstood the comment. As you say below it involves a new underpass and some other big engineering works so not surprised by the cost. Compared to any other transport project it’s a complete bargain. Actually the Beach Rd costs could make an interesting comparison.. street works -v- off street, both in the city centre. For me, it’s the street works rather than the Grafton gully track that has the potential to be a real game changer. I hope their costs are favourable by comparison. Apparently, the Beach Road works are slated to be about 2 million. I make that about 0.003% of the grand $ 68 bn plan for Auckland’s transport.. which gets me thinking, how many of those $ bns could be deferred or avoided altogether just by building more quality cycle lanes like Beach Road? Grafton Gully Cycleway also includes an underpass under a major road, and some significant retaining and earth moving works. That doesn’t come cheap. Also, see it in comparison – the ~4km of Albany Highway North upgrade (adding two lanes and better walk & cycleways) will cost 68 million. Was any thought given to adding a footpath on the bridge, rather than replacing it as-is? Obviously it wouldn’t go anywhere yet, but it’d be future-proofing should we ever get around to building a footpath along the rest of Wellesley Street. I might be a bit late to the party here, but the maps above don’t show any fix for what is possibly the city’s most formed desire path. [IMG]https://imgur.com/a/Ms7dn[/IMG] Now that the work has started, it would be a good time to actually pave this section, which is on the corner of Ronayne Street and Beach Road (map 2 above, near the top of the blue line). Or maybe the council is saving money by waiting until the pedestrians’ feet have carved the dirt away down to foundation level so all they have to do is pour concrete into it?